The end of the fall semester is always a bittersweet time on a college campus. Football, soccer and volleyball seasons come to a close, students return home for Thanksgiving only to return for final exams, and then leave again for Christmas break. For seniors, graduation is right around the corner, for other students, a nice break awaits before returning for the spring semester. Whether its the first or last semester for a student at Belhaven, this ia a busy time of final projects, papers and presentations, and of course final exams. Students returning in the spring should have already gone through Registration Week (it was October 27-31), but there’s still time if you missed out. Students can contact their advisor and schedule a time to meet. Not sure who your advisor is? The Think Center is glad to help. Thanksgiving Holidays are scheduled for November 26-28. All university offices will be closed, and no classes on campus will meet. Residence Halls will remain open for students that are not able to travel home for this short break. Final Exams begin at 6:00 p.m. on December 3 and continue through December 9. December 9 also marks the official final day of the Fall semester. Residence Halls will close at 5:00 p.m. on December 11, and will open again on January 11. Spring classes begin on January 14. As the fall semester comes to a close, there are many events happening on campus. The Theatre Department is presenting its Annual Evening of One-Acts on November 20-21, and DOXA is performing its Dance concert on November 20-21 as well. The Dance Department will also present its Improv Jam on December 1. The Music Department will be busy during the Christmas season. On November 22, Gloria in Excelsis! A Christmas Celebration takes place in the Concert Hall, and on November 24, the Best of Belhaven Concert is slated for the Concert Hall. This all leads up to the 82nd Annual Singing Christmas Tree, scheduled for December 5-6 in the Belhaven Bowl. Blazer basketball is also in action as the semester comes to a close. The men’s squad takes on cross-town rival Mississippi College on November 25, and both the men’s and women’s teams play Brewton Parker on November 28 and Middle Georgia on November 29. The Lady Blazers host Concordia on December 6 to close out the 2014 home slate. We would like to wish all of our students, families, faculty and staff a festive Thanksgiving holiday. As the Psalmist wrote, “Give thanks to the Lord, for he is good; his love endures forever. 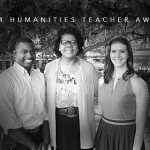 Dr. Elayne Hayes-Anthony, Professor and Chair of the Communications Department, was recently named the 2014 recipient of the Mississippi Humanities Council Teacher Award. 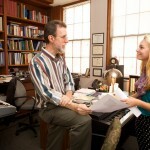 The award recognizes the contribution of humanities faculty at each of the state’s colleges and universities. As part of the award’s commitment to the humanities, each recipient prepares and delivers a public lecture prior to receiving this prestigious award. Dr. Anthony presented her lecture “Breaking News: A Christian Journalist Perspective,” right here on campus last week to a packed audience in Barber Auditorium. With the attention that the news media is garnering in America, Dr. Anthony’s lecture provides a unique Christian viewpoint at how Christian journalists report in today’s high-paced media environment. To view the entire presentation, check out the video below.